For those that didn’t know, UFC 116 took place on Saturday night with Brock Lesnar headlining opposite Shane Carwin for the UFC heavyweight title. It was Lesnar’s first fight in nearly a year after a serious bout with diverticulitis that kept him out of action until the beginning of January. Heading into the contest, it was assumed that whoever left the Octagon with the gold would be the world’s top heavyweight after Fedor Emelianenko’s shocking loss to Fabricio Werdum just seven days prior. Carwin nearly made it a short night for Lesnar, as he rocked the former pro wrestler with a body stiffening uppercut that sent Lesnar running for cover. To the surprise of most, Lesnar managed to survive the barrage of punches and elbows Carwin flung his way. As the 2ndRound began, Lesnar scored an early take down and it was pretty much a wrap from there. Lensar quickly smothered a visibly exhausted Carwin before submitting him. No other heavyweight, not even Fedor, could have survived the beat down that Carwin unleashed on Lesnar at UFC 116. Any questions about Lesnar’s chin were vehemently answered in the Octagon on Saturday. The scary thing is, the world’s top heavyweight is evolving as a fighter. 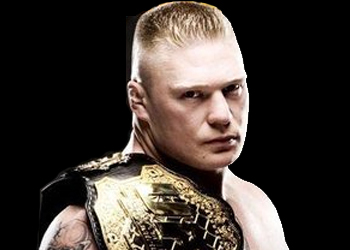 Once thought of as solely a wrestler, Lesnar displayed a ground game that nobody knew existed. His arm-triangle submission on Carwin was as shocking as the bombs that he withstood to survive the opening stanza. If Lesnar continues on this path, we could be talking about him being the best heavyweight fighter of all-time come five years from now.